Emma leads the pack into the finals. Under beautiful blue skies and a mercifully balmy breeze, Swedish slopestyle specialist Emma Dahlström cruised to a first-place seed in Women’s Ski Slopestyle Qualifications today on the Olympic slopestyle course at Bokwang Pheonix Park, South Korea. With style and clean execution being rated highly by the judges, Dahlström’s run checked all the boxes: flawless execution on all of the features, with a clean and technical rail section followed by her signature smooth style in the jump section. Dahlström was followed up in the qualification round by Norway’s two-punch combo of Tiril S. Christiansen and Johanne Killi, then Isabel Atkin of Great Britain. The rest of the 12 women advancing to the finals are a motley crew of slopestylers from around the world, including top guns like Devin Logan and Maggie Voisin of the U.S.A., as well as some upstart challengers like Mathilde Gremaud and Sarah Höfflin of Switzerland. 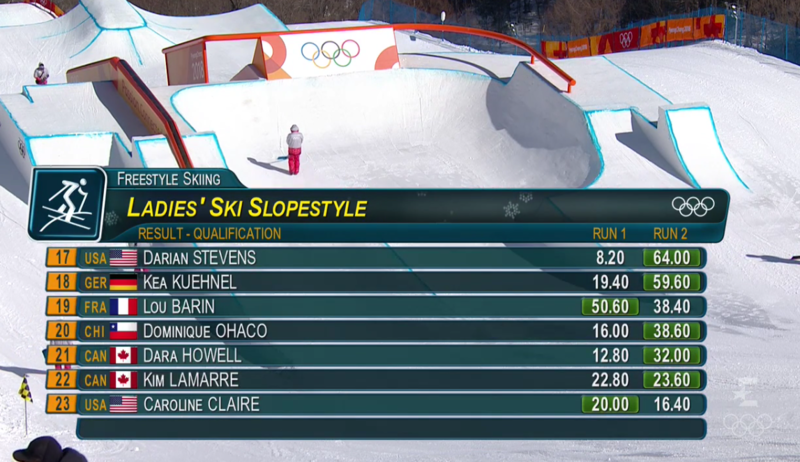 -Both Canadian medalists from Sochi, Dara Howell and Kim Lamarre, are out of the finals after failing to put down runs. -South Korean dark horse Lee Mee-Hyun (known to her American friends as Jackie Kling) put down a solid run and just barely missed the finals by two-tenths of a percentage. 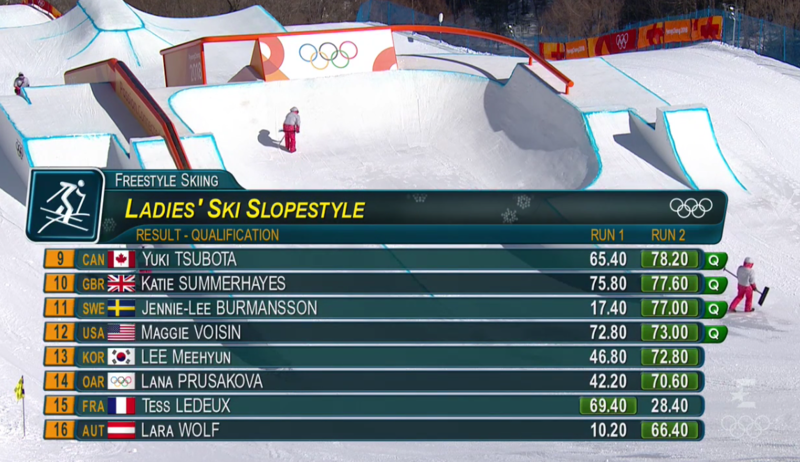 She would have bumped out American favorite Maggie Voisin, who clung on to her 12th-place seed. -Who’s Anastasia Tatalina? This “Olympic Athlete from Russia” came out of nowhere to take seventh in the qualifiers with some big rail tricks and a clean cork 900. -Both Swiss competitors, Mathilde Gremaud and Sarah Höfflin, have made the finals, and could be warming up their double corks. 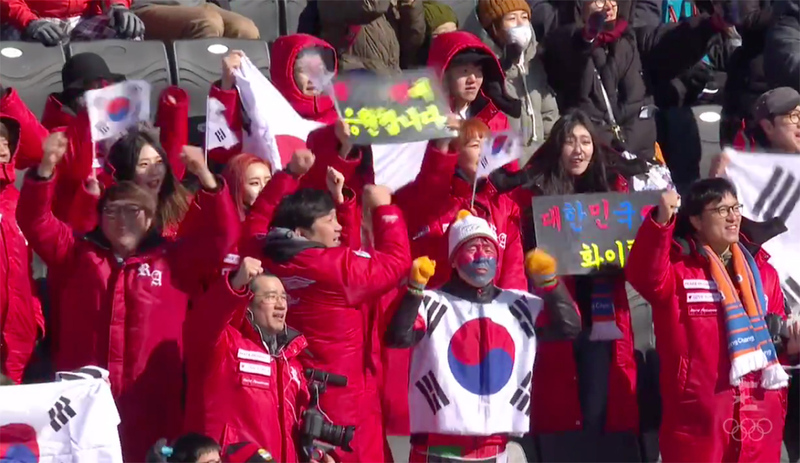 The Koreans, including this memorable character, cheered hard for Meehyun Lee, but she narrowly missed the finals cut in 13th place. The Women’s Slopestyle Finals start at 4:55AM CET and can be watched on the Eurosport Player or a variety of national TV stations across Europe. In North America, NBC (U.S.) and CBC (Canada) should be broadcasting as well.